Unlike deciduous trees, evergreens keep their leaves throughout the year. Many evergreen trees bear edible fruits or nuts. While some home gardeners grow fruit-bearing evergreen trees in their backyards, harvesting edible fruits from evergreens, such as pomegranates, mangoes and avocados, is a multi-billion dollar industry, according to Cal-Poly University. Olive trees are an evergreen species. Although now cultivated throughout the world, pomegranate trees originated in the Himalayan Mountains, northern India and Iran. This tree was first introduced to the United States in the 18th century by Spanish settlers in California, according to Purdue University. Pomegranates have reddish skin, with pulp color ranging from pinkish to white. Pomegranate trees reach heights of 12 to 20 feet; however, they take 2 to 3 years before they start producing much fruit, says the Clemson Cooperative Extension. In the United States, pomegranates grow in regions with moderate to warm temperatures, including California and the Southeast. The harvest time for pomegranates is mid-September through February. Native to the Mediterranean region and central Asia, olive trees are evergreens that grow up to 50 feet when fully mature. The trees start bearing fruit four years after planting. The color of olives starts out green, but it transforms to a deep purple as they ripen. 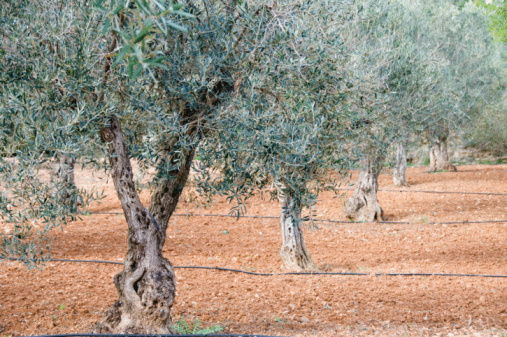 According to the California Rare Fruit Growers website, U.S. growers primarily cultivate olives in Central California, where moderate temperatures are similar to the climate in the olive tree's native region. However, olive trees are also grown at university arboretums throughout the country, including the University of Arizona. Papaya trees are native to Mexico and Central America, but grow commercially in warm and moderate regions of the United States, including the Hawaiian Islands and Florida. According to Cornell University, this fruit has two chemical compounds, chymopapain and papain, that are used to relieve arthritis and aid digestion. These trees grow to 33 feet tall when fully mature, and prefer sandy or rocky soil. Cultivators harvest papayas when the fruit is still green color and let it ripen at room temperatures. Ripe papayas have red and orange-colored skin. Brazil nut trees grow only in South America's Amazon rain forest and are one of the largest evergreen trees there, reaching heights of approximately 150 feet. The nuts are in hard, brown shells, harvested for the oil they produce when pressed. Most nuts fall from the trees during the rainy season, which lasts up to six months. The fallen nuts serve as fodder for small mammals, such as squirrels and agoutis. According to Wake Forest University, harvesting nuts from Brazil nut trees provides a large portion of yearly incomes for families in the Amazon rain forest. What Types of Fruit Trees Grow in Florida?